What is the Best Treatment for Severe Alcoholic Hepatitis? Corticosteroids, alone or in combination with pentoxifylline or N-acetylcysteine (NAC), reduce short-term mortality in patients with severe alcoholic hepatitis, a meta-analysis shows in the October issue of Gastroenterology. However, there is no treatment to reduce medium-term mortality, the authors find. Severe alcoholic hepatitis is characterized by progressive inflammatory injury to hepatocytes and associated liver failure, due to prolonged consumption of large amounts of alcohol. One-month mortality ranges from 30% to 60%. The prevalence of severe alcoholic hepatitis seems to be increasing in several countries. Although several pharmacologic agents and combinations of agents have been reported to increase survival of patients with severe alcoholic hepatitis in randomized clinical trials, little is known about their relative efficacies. Evidence network of pharmacologic interventions to reduce short-term mortality in patients with severe alcoholic hepatitis. The numbers (and numbers in parentheses) indicate the number of trials (and number of combined number of participants in these trials), whereas the thickness of the connecting line indicates the number of trials between comparators. Siddharth Singh et al therefore performed a comprehensive meta-analysis of pharmacotherapies for severe alcoholic hepatitis. The authors used a network approach (see figure) to estimate the relative efficacies of drug regimens that have not been directly compared in individual trials. They found that only corticosteroid therapy reduced short-term (1 month) mortality. There was moderate-quality evidence that corticosteroids alone or in combination with pentoxifylline or N-acetylcysteine (NAC) reduced short-term mortality, and low-quality evidence that pentoxifylline alone reduced short-term mortality. The addition of NAC, but not pentoxifylline, to corticosteroids appeared to be superior to corticosteroids alone for reducing short-term mortality. However, the authors state that imprecise estimates and the small number of direct trials lowered the confidence in several comparisons. No treatment was effective in reducing medium-term (3–12 month) mortality. Singh et al explain that patients with alcoholic hepatitis have psychosocial issues, high rates of recidivism, and lack of social support; these result in poor health care compliance and have negative effects on long-term mortality. The authors propose a combined pharmacologic and psychotherapy approach to treating these patients, to increase long-term mortality. New therapeutic approaches are also needed. In an editorial that accompanies the article, Neehar D. Parikh and Barry Schlansky write that pentoxifylline seems to be an inferior therapy for severe alcoholic hepatitis, with lower quality of evidence to support its use. However, it is an option for patients who cannot take corticosteroids. 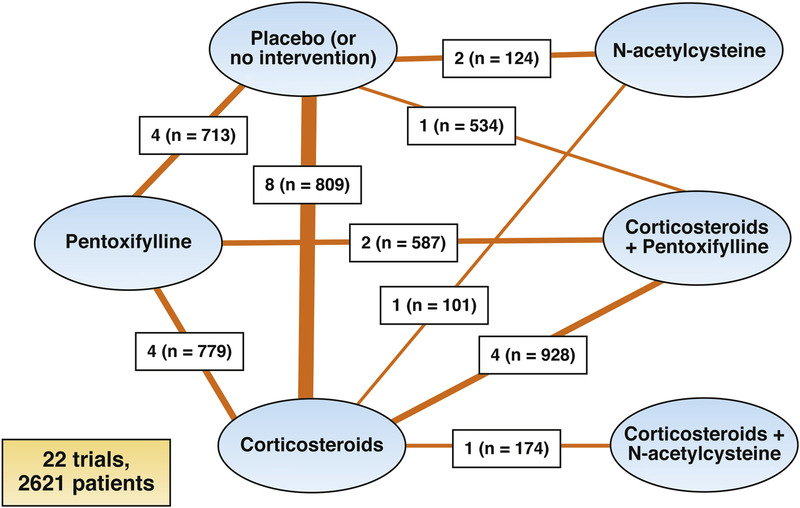 Parikh and Schlansky say that the combination of corticosteroids and N-acetylcysteine seems to be a promising regimen—especially because NAC use has little if any downside. Larger clinical trials of corticosteroids in combination with NAC are therefore warranted, based on the magnitude of benefit and the potential ability of NAC to reduce corticosteroid-mediated infections, due to its bactericidal activities.